My dad won’t stop beeping. Love makes you do crazy things. At least, that’s what Maggie Mayfield’s Dad says. 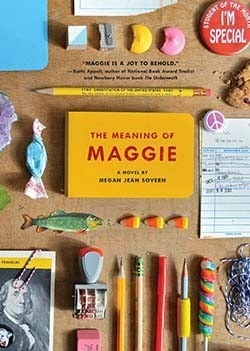 She is about to find out for herself in The Meaning Of Maggie, a novel by Megan Jean Sovern. As the youngest of three children, Maggie has aspirations and goals. She’s the girl you’d probably want your eleven-year-old to be best friends with. Out of her two sisters she considers herself by far the most responsible. She wants to be president one day. She’s a good student. She follows all the rules set by her family. In fact, she actually has a book outlining all the rules that her mom has outlined for the family. On her eleventh birthday, she receives a beautiful leather bound journal. She decides to write the story of her life – since she’s turned eleven. She thinks her Dad – who happens to be in a wheelchair – is the coolest Dad ever. And although there are setbacks in her life and her dad’s recovery, Maggie is not about to lose hope. Because she believes that brave people never, ever give up. So she motors on, in a way that is all her own. She is frustrated that her family is shielding her from her dad’s condition. She wants to know more. What will she do when she finds out about the specifics of her dad’s gut-wrenching illness? At eleven years old, will she be able to continue life with the same zest she’s always had? The voice of Maggie is funny, lovable, and most of all right on target. She tackles through life the way an eleven year old would, but with a zest and positivity that makes her life entirely her own. It is lovely the way, author Megan Jean Sovern tackles the issue of an incurable illness in a family for a younger audience. The book is written for ages 8-12 years but it reads in a wonderfully mature way. The Meaning Of Maggie is published by Chronicle Books, and distributed in Canada by Raincoast Books.